Populations in Montana and across the Northern Rockies have undergone recent declines. Comment213,835 square kilometers based on Natural Heritage Program range maps that appear on the Montana Field Guide. CommentSagebrush covertypes have declined since European arrival, but shrubby habitats have probably increased in forested areas as a result of timber harvest. Overall longterm trend may best be categorized as stable to within +/-25%. CommentBreeding Bird Survey (BBS) data is of moderate credibility with a significant negative trend of -3.7% per year or -32% per decade. BBS data for the Northern Rocky Mountains is of highest credibility and shows a nonsignificant trend of -1.1% per year or 11% decline per decade. We interprete these data as indicating a decline of between 10-30% over the short-term. ScoreF - Widespread, low-severity threat. Threat is of low severity but affects (or would affect) most or a significant portion of the population or area. CommentHabitat loss from sagebrush removal and fire suppression in conifer forests that reduces shrub regrowth both represent potential threats to the species. CommentAlthough sagebrush covertypes take a long time to recover, other shrub species tend to respond relatively quickly to disturbance and the species should be able to respond quickly to this shrub regeneration. CommentModerate Generalist. Species uses a variety of shrubby habitats in shrub steppe or disturbed and regenerating forest areas. The Green-tailed Towhee is a large, secretive sparrow of shrub-steppe habitats, spending much of its time scratching the ground to move leaf litter in search of food. Its catlike "mew" calls and vigorous foraging method often reveal its presence. Males sing a song of jumbled notes and trills (Dobbs et al. 2012). Singing males observed in suitable habitat in May. Several records of nestlings and/or fledglings in June and July. Nests with eggs observed as late as July 4, and a late observation of an adult feeding recently fledged young recorded in early September. 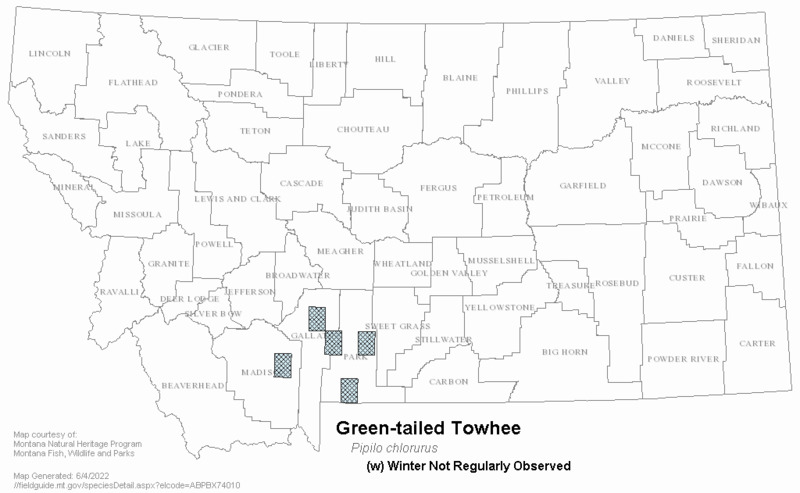 Observations in December-February suggest this species occasionally overwinters in portions of Montana (Montana Natural Heritage Program Point Observation Database 2014). Sexes similar in appearance, but some females show slightly duller plumage than males, especially on crown. Upperparts are olive green with gray breast, long greenish tail, and conspicuous reddish brown cap. White spot above the cheek, a white mustache, and white chin, throat, and belly contrast with gray on head and breast. Juvenile lacks contrasts, mainly brownish gray above and white below (Dobbs et al. 2012). 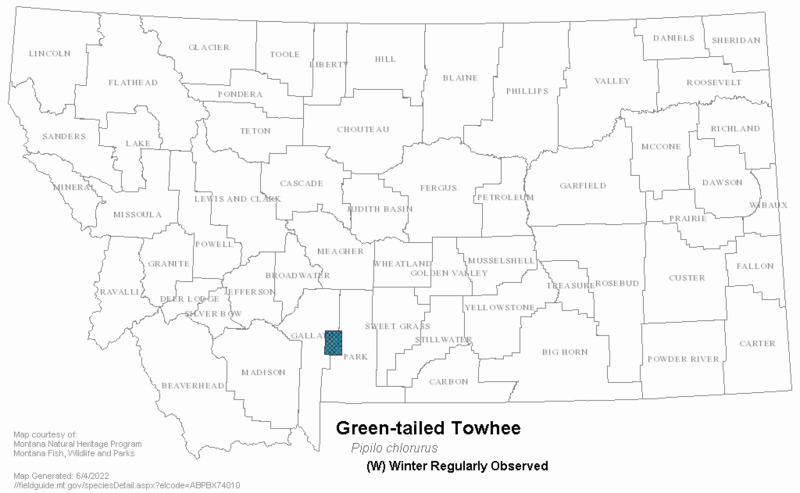 In Montana, the Green-tailed Towhee occurs in shrubby habitats across most of central and southern Montana. In the Bozeman area, normal migration periods are May 24 to June 5 and August 25 to September 10. Habitat selected for breeding varies with elevation, prefers species-rich shrub communities. Typically occurs along the ecotone, or edge, of sagebrush communities and other mixed-species shrub communities such as Chokecherry, snowberry, serviceberry, and mountain mahogany (Dobbs et al. 2012). 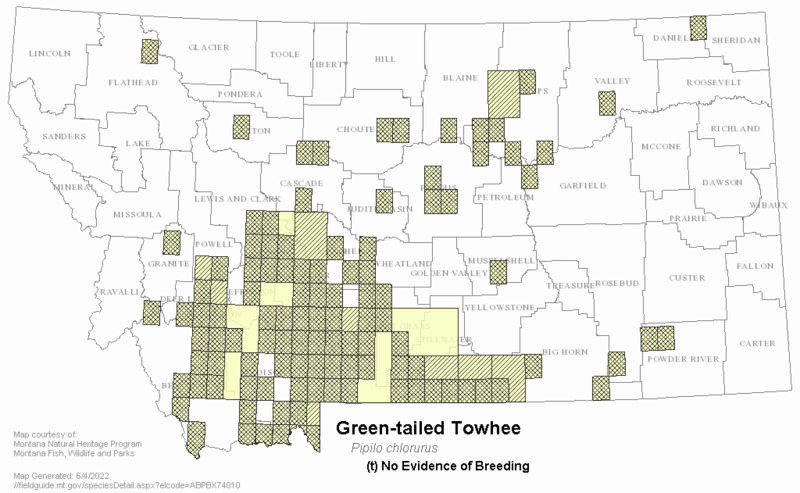 The Green-tailed Towhee feeds primarily on the ground or low in dense, shrubby vegetation. Searches for food by scratching or hop-kicking back and forth to move surface leaf litter and expose lower layers of leaf litter or bare ground. Eats primarily seeds, small insects and some fruit (Dobbs et al. 2012). Apparently only an occasional host for the Brown-headed Cowbird (Dobbs et al. 2012). Locates its bulky nest in patches of dense, healthy shrubs, which provide heavy concealment. Eggs are pale, tinted sky blue turquoise, with reddish brown speckling. Clutch size typically 3 to 4 (Dobbs et al. 2012). Nests with eggs have been found from May 27 to July 4 (Montana Natural Heritage Program Point Observation Database 2014). Only females incubate eggs; incubation period lasts from 11-13 days. Females brood nestlings, but both parents feed nestlings. Nestlings leave the nest 11-14 days after hatching; parents feed fledglings for at least two weeks after fledging (Dobbs et al. 2012). 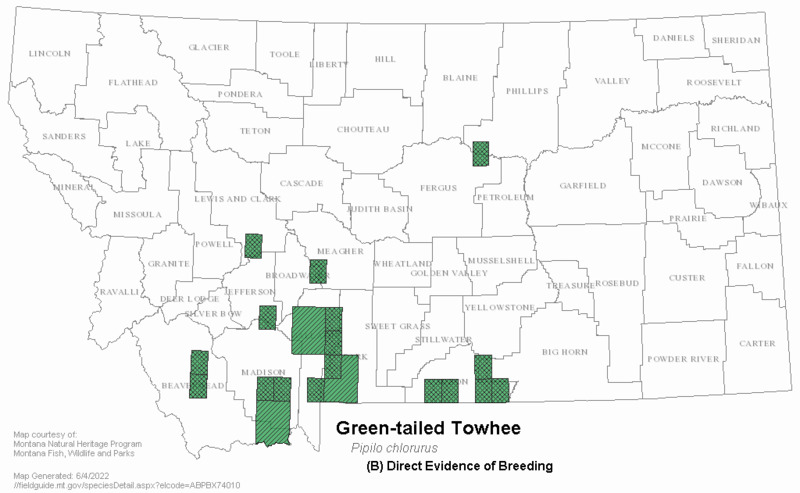 Maintaining diverse, vigorous shrubland communities is essential to support breeding populations of Green-tailed Towhee. The interacting effects of livestock grazing, non-native species, particularly Cheatgrass, and fire management influence habitats for this species (Dobbs 2006). Loss of diverse and healthy shrub communities may in occur in areas overgrazed by livestock, invaded by non-native plant species, or converted to agricultural lands (Dobbs 2006). Andrews, R., and R. Righter. 1992. Colorado birds: a reference to their distribution and habitat. Denver Mus. Nat. Hist. xxxviii + 442pp. Bock, C.E., M. Raphael, and J.H. Bock. 1978. Changing avian community structure during early post-fire succession in the Sierra Nevada. Wilson Bull. 90: 119-123. Burleigh, T.D. 1972. Birds of Idaho. The Caxton Printers, Ltd., Caldwell, ID. 467 pp. Franzreb, K.E. and R.D. Ohmart. 1978. The effects of timber harvesting on breeding birds in a mixed-coniferous forest. Condor 80: 431-441. Hayward, C.L., C. Cottam, A.M. Woodbury, and H.H. Frost. 1976. Birds of Utah. Brigham Young Univ. Press, Provo. 229 pp. Hejl, S. J. 1994. Human-induced changes in bird populations in coniferous forests in western North America during the past 100 years. Pages 232-246 in A century of avifaunal change in western North America (J. R. Jehl, Jr. and N. K. Johnson, Eds.). Studies in Avian Biology No. 15. Hendricks, P. 2000. Roadside bird counts on BLM lands in Petroleum and Fergus Counties, Montana. Montana Natural Heritage Program, Helena, MT. 57pp. Knopf, F.L., J.A. Sedgwick, and D.B. Inkley. 1990. Regional correspondence among shrubsteppe bird habitats. Condor 92: 45-53. Morton, M.L. 1991. 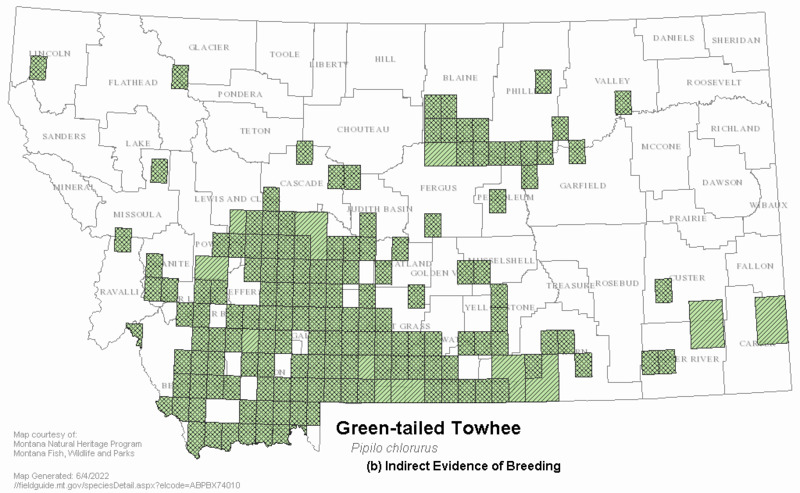 Postfledging dispersal of green-tailed towhees to a subalpine meadow. Condor 93: 466-468. Phillips, A., J. Marshall, and G. Monson. 1964. The birds of Arizona. Univ. Arizona Press, Tucson. Pitkin, P. and L. Quattrini. 2017. Pocket Guide to Sagebrush Birds. Bird Conservancy of the Rockies and Point Blue Conservation Science. 68 p.
Raphael, M.G., M.L. Morrison, and M.P. Yoder-Williams. 1987. Breeding bird populations during twenty-five years of postfire succession in the Sierra Nevada. Condor 89: 614-626. Sedgwick, J.A. 1987. Avian habitat relationships in pinyon-juniper woodlands. Wilson Bull. 99: 413-431. Wiens, J.A. and J.T. Rotenberry. 1981. Habitat associations and community structure of birds in shrubsteppe environments. Ecological Monographs 51: 21-41. 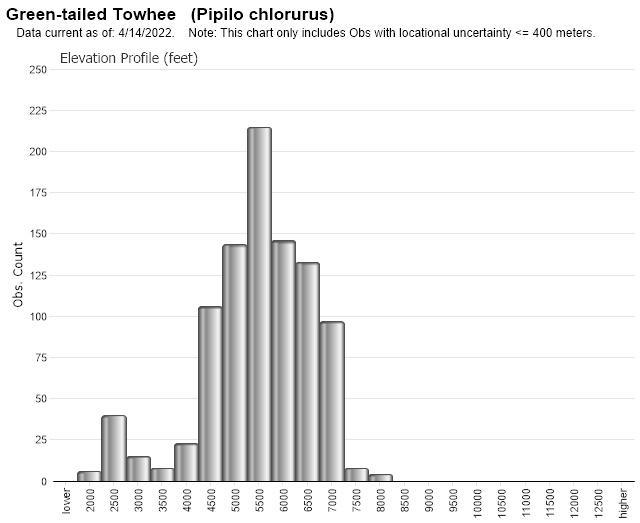 Web Search Engines for Articles on "Green-tailed Towhee"